This is a big slouchy hat. I don’t currently own a big slouchy hat, so I’m not even too sure how one would look on me, but I enjoy the knitting of the knitting most, so if it doesn’t turn out I can give it away. It’s a big, slouchy, pink hat, in case you couldn’t tell. It’s winter here, so daylight is hard to come by. The reason I’m making a big, slouchy, pink hat is simple: SSK. SSK is a knitting retreat that will be happening in Nashville in June of 2012. 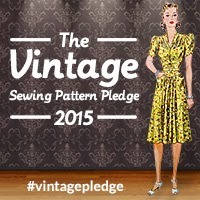 It’s being hosted by the Knit Girllls and Carin from Round the Twist, and I actually got in! There was a lottery for spaces, and luck was with me that day. To get everyone excited in the Ravelry group, there is going to be a series of knitalongs between now and June, and you can get extra raffle tickets (to be used in Nashville in June) by participating. 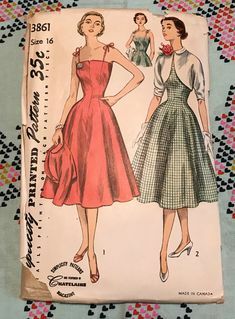 This month, you have to knit a Wendy Johnson pattern, and you’ll get extra raffle tickets if you use yarn from one of the vendors that will be selling at the market in Nashville. I ordered this yarn, thinking it was red, from Cloudlover back in October. The first ball got lost in the mail, so this is actually the second ball that was shipped to me. Great customer service! I’m glad I picked a hat pattern – I was skeptical that I could knit a pair of socks in the timeframe given, and with the shipping delays I definitely wouldn’t have finished in time. As it is, I knit most of this hat up in a day or two, and just haven’t had time to sit down and do the decreases recently. As long as it is done and photographed before November 30th, I get my raffle tickets. I’m super-excited about the Super Summer Knitaway – I’ve been to big things like the Sock Summit before, but never a smaller, more intimate retreat. And I think Nashville will be awesome – one of the ladies at The Heatley Cliff podcast used to live there and talks about it every now and then. I need to go back and make notes on where to go! No model shot, as the boyfriend is playing computer games. I don’t like doing the whole in-the-bathroom mirror thing either. So sometime you may get to see me in my hatty goodness. What makes me very excited is the my boyfriend thought it was cool, and said so! Said he may even want one for himself, in say, navy. The only mod I made to the pattern was to knit the body of the hat in reverse stockingette. Or rather, I knit stockingette, then turned it the other way out. I like the way it looks, it’s a bit more textured seeing the ‘wrong’ side rather than the ‘right’. Also, I thought it was supposed to be 8″, so I did the first decrease row, then realised that it was supposed to be 9″. 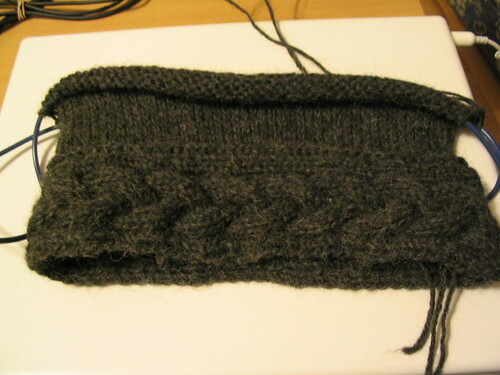 I knit a few more rows, then continued decreasing, and it didn’t seem to make a difference. Oh, and yeah, after picking up the stitches around the band, I forgot I was supposed to do a purl row. So that was knit one row (my oops), then purl one row (rather than tinking back a whole row). It looks like I wasn’t paying too much attention to the pattern. Oh well, this is less for style, and more to keep me warm and toasty the next time it gets to -38C. Now, do I finish that sweater sleeve, so that is at least done, or start on the fingerless mitts? Coronet so far. It says to knit until it is 8″ from the bottom of the band, It’s about 5″ right now. I was listening to the CraftSanity podcast the other day, the one where she is talking to two ladies from KnittaPlease. I really like what they do, I think it’s great fun. Then, I got to actually thinking about it, and it’s not a concept that can work here. When it can get down to -40C or colder overnight, putting a blanket around a pole would not be as appreciated as giving a blanket to a homeless person. The shelters are all full, people do indeed sleep outside in this weather, wondering if they’ll wake up in the morning. If I could knit fast enough, I’d knit a blanket, but it wouldn’t be done until the heat of summer. I think tomorrow, I bake cookies. But for now, I answer questions for the Stranded! Knitalong. I have just one project, Eunny’s Endpaper Mitts. I posted the yarn for them a few posts below. 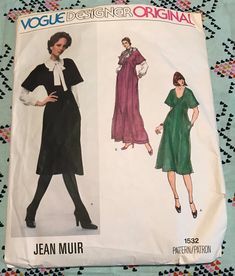 I’m trying to be good about finishing stuff, so I’m not going to start until I finish my Coronet (pay no attention to that sweater behind the curtain!). Is this your first colorwork project? If it isn’t, what was your first, and has it survived the test of time? 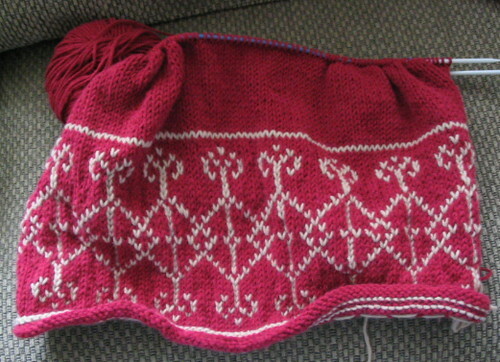 But yeah, that was my first colourwork, and it didn’t even stand the test of being finished. I haven’t done any since then, so I feel like I’ve never done it before. Also, the yarn for the mitts is much thinner. Although, I always felt with that yarn that it was too defined for colourwork. Colourwork needs a bit of a fuzz, I think. That stuff was like perfectly round rope, but soft. I’ll definitely make something with it, I just don’t know what. I’ve put the sweater aside for bit. It’s SO. DAMN. COLD. here I decided I needed to knit myself a hat. I’m too poor to buy any more yarn (haven’t started those fingerless mitts yet, I’ll explain after some hat-ness), so I went through what I had in my stash. 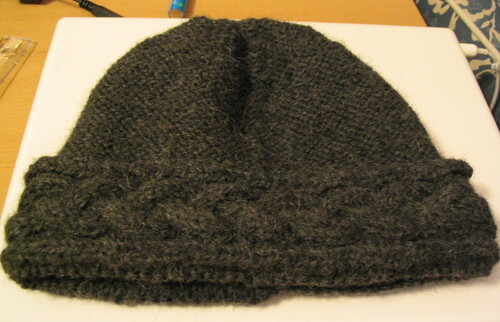 My original plan was to make a hat out of some alpaca yarn I’ve have for a while. The brand is called ‘alpaca Indiecita’ and I’ve had it since about… *thinks* October 2003, so it’s time it got used. I’ve got some charcoal grey, and some cream. Looking at it, I realised the gauge was pretty small, and if I wanted a hat any time this year, I’d need to double it. I doubled, swatched, and found that it was close enough to the gauge for Coronet from Knitty! So I started. Crappy photos because the sun set at 4:30pm today, so no natural light. 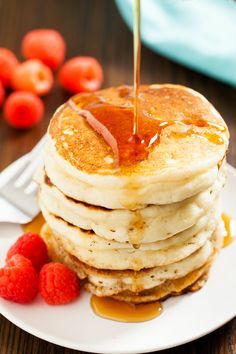 You may notice some ends hanging out the sides. Let’s take a closer look at those, shall we? Now, why would a solid colour band have so many ends? The project that I originally bought this yarn for, and started waaay back in October 2003 was a sideways-knit garter stitch scarf, with a self fringe. In other words, at least a ball of this stuff was in lengths. And as I’m using them doubled, each change is four ends. 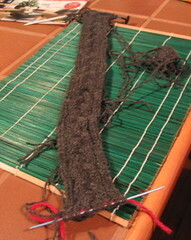 Each scarf-length did about three repeats of the cable pattern. I’m making the medium size, even though I most definitely have a large head, as that is what my gauge is dictating. I did 17 cable repeats, which fits my head just snugly enough, rather than the 18 the pattern says to. 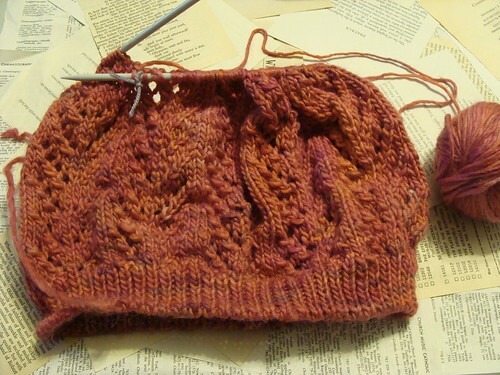 I think I may knit the body of the hat in reverse stockingette, because I do like the way it looks. I’m also undecided as to whether I will knit any of the cream in with the charcoal. That’s what the swatch I made was. I ripped it out though. I almost always rip out my swatches once I’ve found and noted gauge, I should really stop doing that so I can have something to refer to. I also really wanted to start those fingerless mitts of Eunny’s, and I wound the one skein into a ball, and dug the end out of the other one (I hate those centre-pull balls! I can never find the end, I dug out about half of the yarn entrails before I found the end), and then was having problems deciding what size I need to make. I’m right between small and medium, so I’m not sure. Also, I thought any sock yarn would do, so I didn’t think of gauge, and I don’t have the yarn with me right now, but I think I’ve got a different size of yarn that Eunny made hers out of, so I’m going to have to think long and hard about that. In other news, it was -32C outside today. So I didn’t go outside. 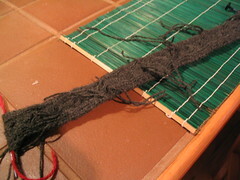 I think I will weave in some ends now, so I can get some hat going tomorrow.